This is a great idea if you’ve got kids who get bored doing their homework. It’s also a great parent aide (particularly if you get asked those tricky questions like “how high is the sky?” or “when was Cleopatra born?”, or “how do you spell ‘prestidigitation’?”) As Brian has stored within his animatronic brain The Concise Encyclopedia from Britannica®, a dictionary and also a world history timeline, you should be able to ask him virtually anything and he should know. 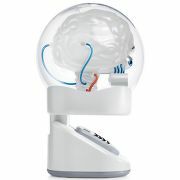 The kids will think Brian the Brain is such a cool addition to their room and can also act as their own personal filo-fax, keeping all their important telephone numbers and dialing them on their voice command (when he’s plugged into the phone socket). Brian the Brain has a digital clock, MP3 player socket, pull out keyboard, a calendar to record those important dates (like how many days until your birthday/Christmas/School Disco) and integrated speakers so you can listen to your favorite tracks whilst you’ve got your head in the books. As it’s now a new school year (and homework will probably be getting that little bit more difficult), perhaps you can persuade your parents that Brian is an absolutely essential requirement – or they’ll have to brush up on their knowledge of Tolund Man and poets of the First World War! 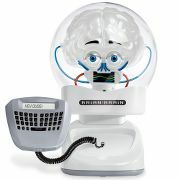 Brian the Brain is available from Hammacher Schlemmer for $119.95 (or via Amazon for $99.99) and also comes with a 3 month subscription to Britannica On Line®, Student Edition. I love brian the brain because he is clever. When he talks his mouth glows. When I say games he goes to trivia. love brian he is my bffl! i think Brian is the best he helps me with my home work so all i have to do is ask him a ? and he answers it then i just have to write the answers down on paper :(:(:(:((:(:( but on the up side he gets my top marks with home work and my friends.